Even today a large section of executives working with large enterprises tend to carry BlackBerry handsets. While most BlackBerry handsets come loaded with a host of applications for office use and offer great security features, they tend to be way short in their entertainment quotient. The multimedia support for different video formats in most BlackBerry handsets is limited and often you would not be able to play your favorite videos. However you always can convert your favorite videos into BlackBerry supported formats using the BlackBerry Video Converter Factory Pro 6.1 application. Loaded with a set of sophisticated editing options, this versatile tool can also help you in creating custom video clips. 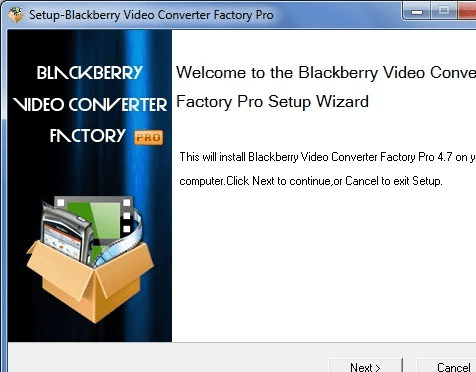 The BlackBerry Video Converter Factory Pro 6.1 on launch sports a vivid interface which is rather aesthetically appealing. You can simply start by loading the video track or even a complete DVD into the application and then choose to initiate the conversion process. Given the fact that people prefer to keep small clips or music videos on their handset, the application offers you the flexibility to extract clips as per your choice. Moreover you can add different clips into a single video file or create a mash-up. You can even change the screen size based on your requirements and place in relevant effects such as emboss or mosaic. It allows you to convert the files in MP4, AVI besides 3GP and the standard WMA format etc. Thus it works for most BlackBerry phone ranges including the Bold and Curve series. Overall speed of conversion is quite good and the application does not seem to hog your system resources. After using the BlackBerry Video Converter Factory Pro 6.1 application we can undoubtedly recommend it on account of its rich feature set along with optimum performance and mark it with a score of 4 rating stars. In this new version, more human- oriented UI has beendesigned. The setting parameter are more specific. So users' operation experience will be enhanced. At the same time, the converting speed is much faster.